My fiance Sean is something of a connoisseur of ramen. If it’s available on a menu at a Japanese restaurant, he’s pretty much guaranteed to order it. Tonkotsu ramen, toto ramen, spicy ramen, extra concentrated broth ramen – you name it, he’ll try it. So behold, homemade chicken ramen with the smallest amount of effort possible to make ramen. 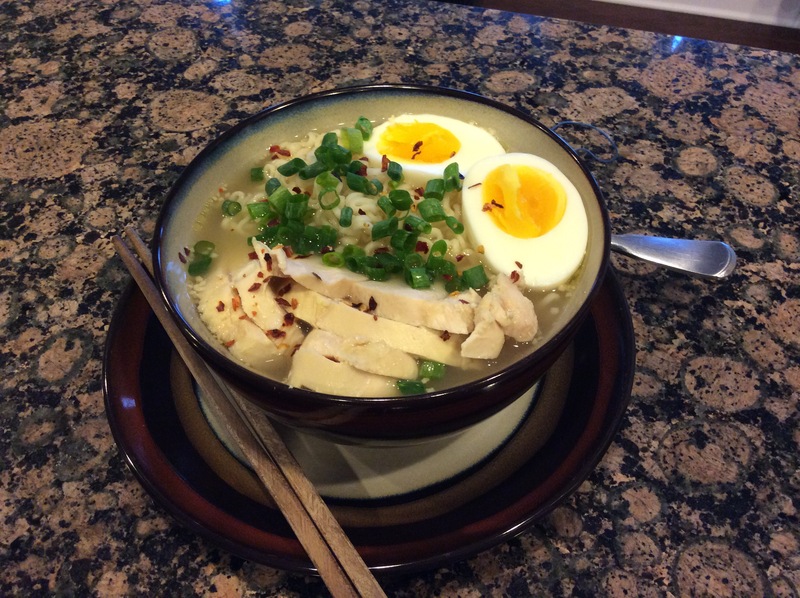 Put some chicken and eggs in a slow cooker, add broth, cook, add ramen, cook more, done. Bada bing, bada boom. Try this recipe some afternoon and tell me you’re not a believer. Cover and turn the slow cooker on low for 2 hours. After 2 hours, check if the eggs are soft-boiled by chilling and peeling one. If they are, remove all the eggs to an ice bath, if not, give them an extra 10 – 20 minutes and check again. Once the eggs are done, check the chicken is cooked through after 2 – 2 1/2 hours. Remove the chicken from the slow cooker and the scallions. Place the ramen noodles in the slow cooker broth (and mushrooms, bamboo shoots and seaweed if you’re using them), then cover with the chicken breasts to make sure they stay submerged. Cook covered for another 10 – 15 minutes until the noodles are cooked. Remove the chicken and slice, divide up the noodles, broth and sliced chicken among six bowls, add 1 egg peeled, sliced in half to each bowl and garnish with chopped scallions, crushed red pepper flakes and a splash of soy sauce for extra flavor. This is nothing like those styrofoam cups they try to pass off as food. This is real ramen! This post is part of the monthly link up party Our Growing Edge. This event aims to connect food bloggers and inspire us to try new things. This month is hosted by Nikki from Everyday Life Mother and Wife. Well done with trying this at home! For me, I love the firm, slightly chewy texture of restaurant ramen. I don’t know anyone that sells it fresh to the home cook.